Print copy of the magazine will be delivered to your address every month. 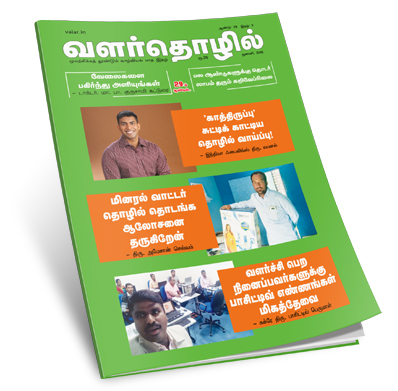 ValarThozhil is a Tamil Business and Industrial Monthly magazine focused on providing its readers with quality information about entrepreneurship for the past 30 years. மருந்துக் கடை நடத்தி வெற்றி பெறுவது எப்படி? தனி வீடு வாங்க ஆர்வம் காட்டுவது ஏன்?